Everything was going smoothly, a typical first night of Hanukkah. Or so Harvie thought! There was someone else in the house, and he had presents, too—Santa Claus! Hanukkah Harvie vs. Santa Claus is the hilarious and heartfelt story of how two holiday heroes wind up with the greatest gift of all for themselves: friendship. Finally! A holiday tale that is affecting without heaping on the schmaltz. Which holiday heavyweight will outdo the other in bringing joy vey to the world? If you don’t find yourself snickering at Slater’s whimsical world of Hanukkopters and other well-oiled contraptions, you are definitely in the menorah-ty! David Lubar, Author of Hidden Talents and Sleeping Freshmen Never Lie. 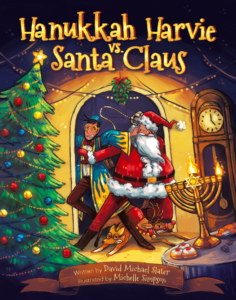 “At long last: the dueling holidays reconcile as Hanukkah Harvie and Santa Claus discover Chrismukkah. This is the tradition-defining story that every blended family will want to read as they sit beside the Chrismukkah bush amidst an avalanche of presents. In this wordless story, a library book tries desperately to evade the destructive clutches of a little boy. What drives the Boy, however, is enthusiasm and love—not malice—and the Book eventually responds in kind, accepting his rough but worthy fate. A nearly wordless picture book presents the “I can read” moment. A small boy with a determined, mischievous expression enters a library in the company of his mother. The look on the boy’s face, perfectly rendered by Kolar (as are all the expressions), alarms the library books, and they run for their lives. The boy captures a blue-bound book and begins manhandling it as he would any toy, in the process ripping and creasing the pages. The other books look on, horrified. The boy’s mother (who, unsettlingly, seems to care not a whit that the boy has mistreated a book) comes to get him. He tosses the book to the floor as he leaves. The other books lovingly glue and tape the battered book back together. A new day, and—horrors!—the boy returns. Again, the books scatter. But then the blue-bound book sees the boy’s forlorn expression and suddenly understands. The book leaps from its safe perch to the boy, the boy opens the book, and it is here that the four words of text make their powerful statement—”Once upon a time.” For the boy has learned to read, and now books are cherished and library manners learned. Presented as a grand adventure, the moment when a child first learns to read is powerfully rendered in this well-made story. 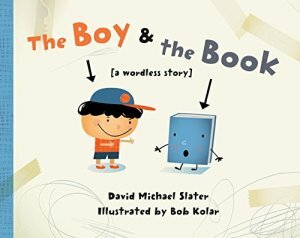 Slater’s (The Bored Book) wordless story seems headed toward a lesson about mistreating library books, but the lesson turns out to be one of surprising compassion. The book abuser is a young library visitor with a mop of black hair who grabs a blue book while the others flee (all of the books have expressive faces and sticklike appendages). A question mark above the boy’s head as he opens the book signals his non-reader status. Instead, he holds it upside down, rips it, tosses it, and folds the pages, accompanied by anguished looks from the book itself. On a return visit, the book’s efforts to avoid the boy are futile, and he strikes again. But then something wonderful happens: the boy learns to read, and he and the book are reconciled. Kolar’s (Stomp, Stomp!) digitally made figures are crisp and flat, and the expressions on the books’ faces do their comic work effectively. Library champions don’t usually tolerate the ill-treatment of books, but sometimes, Slater implies, what looks like bad behavior is just boundless eagerness. The Boy & the Book is an original tale told entirely with brightly colored pictures. A young boy loves to read, but he doesn’t understand how to handle books – he wantonly tosses library books around and tears their pages. Poor, innocent books! The anthropomorphic books of the library help the boy’s literary victim recover with tape and care, but what will they do when the boy comes back? Will the boy ever learn not to be so rough with books? A simple tale about learning to respect the things one loves, The Boy & the Book is highly recommended. A wordless romp shows the havoc that ensues when a pre-reader has marvelous fun playing with a book with no clue of its intended use or any regard for the book’s safety. As the boy leaves a library, one blue book is left with its pages in tatters. Its companion picture books swoop in with tape and glue to put it back together again. When the boy returns some time later, the books react with terror, scrambling to hide and get out of his reach. But the boy’s tears stoke the courage of the now-battered blue picture book, who cautiously decides to rejoin him and discovers a marvelous change—the boy can now read! Young readers will enjoy the panicky reaction of the books, the various bits of Scotch tape and scribbling that show up on the actual book’s covers, as well as in the story, and pick up a gentle lesson on book care along the way. Computer-rendered illustrations are predominantly blue, red, and orange and show plenty of action and a convincing range of expressions on the faces of both humans and books. Westley and his mom are the perfect pair of pirates. That is, until she tells him she’s going to marry Stan. When she asks Westley to be the ring bearer at the wedding, he hears “Ring Bear.” So…there’s only one thing to do: become a REAL bear and wreck everything! THE RING BEAR has been chosen as an HONOR BOOK by the SSLI – The Society of School Librarians International! It has also been selected for inclusion in the nationwide Accelerated Reader program. Column: Uncle Orson Reviews Everything Herbie, Already, Alot, Alright, Peck, and Ring Bear June 26, 2005 First appeared in print in The [ http://www.rhinotimes.com ] Rhinoceros Times, Greensboro, NC. Even though my youngest is really too old for picture books, I still can’t resist them. Recently I picked up The Ring Bear, written by David Michael Slater and illustrated by S.G. Brooks. In the story, a young boy plays pirates with his mother, wearing eyepatches and going under the noms de guerre “Westley the Wicked” and “Mom the Mean.” Mom’s friend Stan doesn’t play — he won’t wear the eyepatch. He enjoys watching their imaginative life, but it’s something they share between themselves. Then Stan and Mom decide to get married, and when they ask Westley to be the ring bearer, he misunderstands and thinks of himself as the Ring Bear. As a bear, he can show his anger at Stan’s intrusion, and he is fully prepared to devour the ring rather than carry it up to Mom and Stan. This is a sweet, charming, funny, tender book. The art is warm and witty, the writing understated and, precisely because it isn’t maudlin, it brought a tear to my eye. It’s not a “problem” story, to be trotted out when a kid’s mother is about to remarry. It’s a story any kid could enjoy, treating the remarriage issue as the simple fact of family life that it so commonly is. Click on the link to hear a Podcast interview about THE RING BEAR! The Ring Bear was featured on JustOneMoreBook.com podcast (April 6, 2007). Podcasters Mark Blevis and Andrea Ross call The Ring Bear “an incredibly fun and endearing little story.” For a link to the audio visit http://www.justonemorebook.com/?s=ring+bear. A transcript of the show is available at [ http://flashlightpress.com/ringbear.html ]http://flashlightpress.com/ringbear.html. Sensitively created, this picture book does a masterful job in showing us how confused a small child can become when his or her home life is changed in any way. Confronted with the idea of his mother’s marriage to Stan, Westley wonders if his mother still wants him and also if Stan wants him. The shifts that Westley makes between his imaginary personalities and his real self not only show us how powerful the imagination can be in a child’s life but it also emphasises Westley’s uncertainty. The boy takes refuge in an imaginary world when the real world becomes too bewildering and worrying for him. After a while he isn’t quite sure which world he belongs in. The illustrations in this unique picture book are full of vibrant and glowing colour and the illustrator’s portrayal of the sad little boy is both touching and affectionate. A charming and tender tale…[that] opens the door for parents and children to speak with each other about their own evolving families. 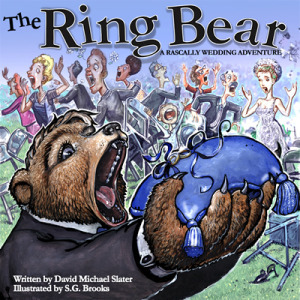 The Ring Bear: A Rascally Wedding Adventure is a children’s picturebook that deals with a serious theme. A young boy is used to living with just his mother; he doesn’t want a stepfather, yet she is getting married and anxious to show him that he will always be a beloved member of the new blended family. He is to be the ring bearer, but he hears it as “ring bear” and decides to dress up as a bear to scare everyone away! 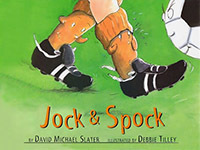 The captivating illustrations by S. G. Brooks tell of the struggle to bridge rifts of fear and mistrust with enduring love, in this [an] original, warmhearted, and highly recommended story by David Michael Slater. …Addresses common stepfamily issues… and offers an imaginative and sensitive solution. It was a pleasure reading this – the text and the illustrations are both lively, and work well together – as a successful illustrated book should! 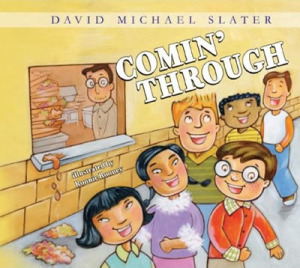 …With humor and compassion, author David Michael Slater gets at the heart of the child’s worry and anger.